Explore Vietnam's picturesque Mekong Delta on a 9-hour trip with a convenient pick up from your hotel in Ho Chi Minh City. The Mekong Delta, located in southern Vietnam, is a stunning maze of rivers, islets, small villages with rice paddies and fruit plantations. 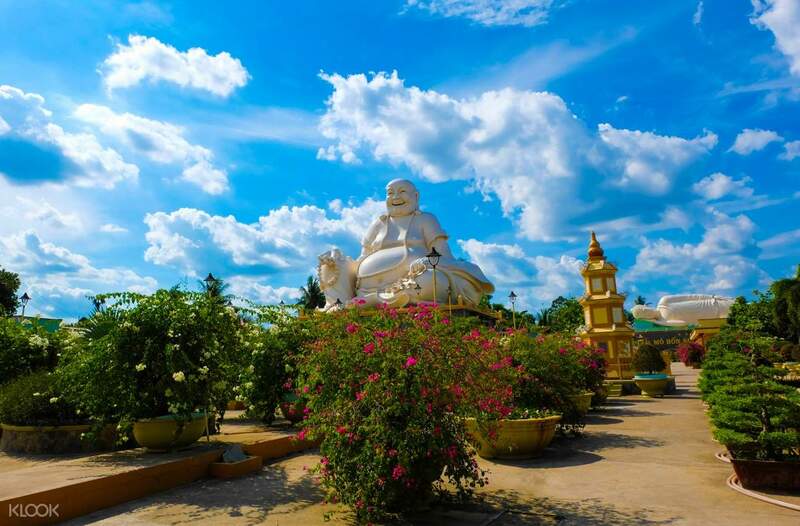 After an early morning pick up from your hotel in Ho Chi Minh, head over to My Tho and see the peaceful Buddhist Vinh Trang Pagoda. Then, hop on a boat for a calm cruise along the river observing stilt houses, fruit plantations and fishing villages. Head over to Tortoise Islet for lunch before continuing on a boat to An Khanh in the beautiful green province of Ben Tre. Here, you will get to enjoy a light snack of seasonal fruit and aromatic honey tea to the sound of Vietnamese folk music. Stop by for another delicious surprise with a visit to a coconut candy family business before heading back to Ho Chi Minh. 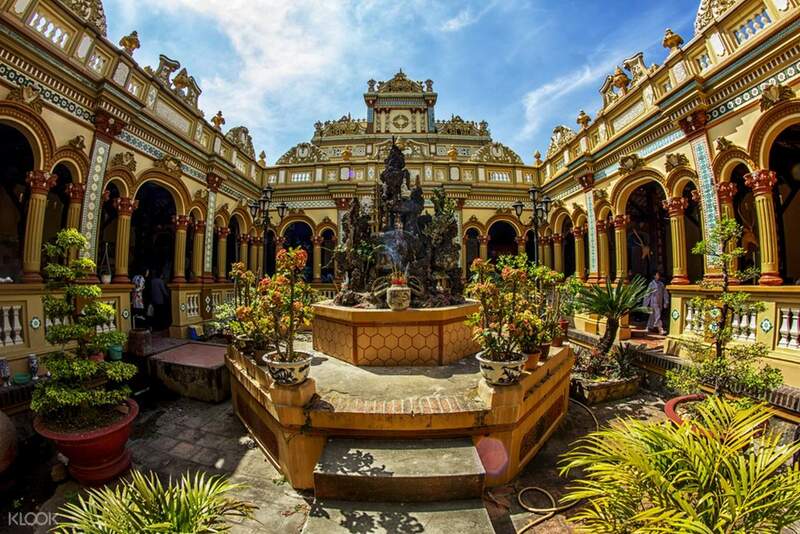 Book a Mekong Delta day tour from Ho Chi Minh City at Klook and enjoy great discounts! This activity is truly the highlight of our Vietnam trip! 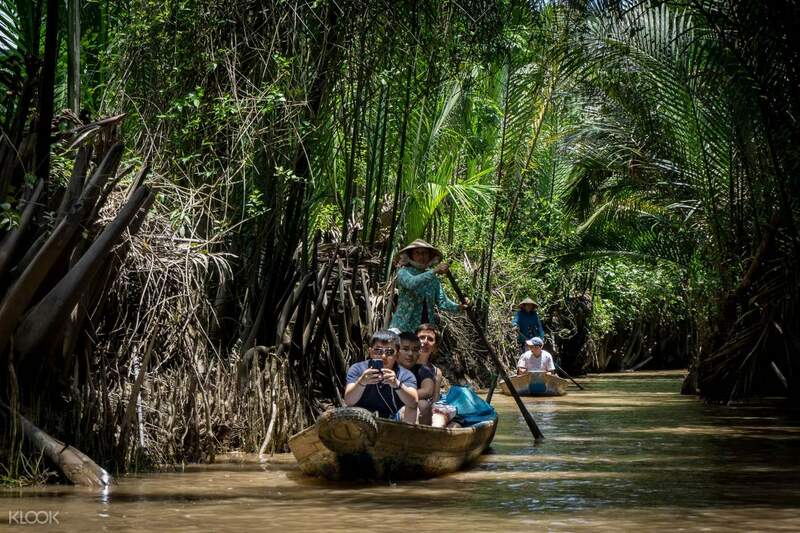 You’ll really get to experience the culture of Vietnam first hand through this trip - from tasting their local delicacies, riding their gondola, to interacting with natives. Our guide (Mr. Trew) also did a wonderful job in making the tour a memorable experience for all of us! He went above and beyond his role and tried his best to accommodate everyone. This activity is truly the highlight of our Vietnam trip! 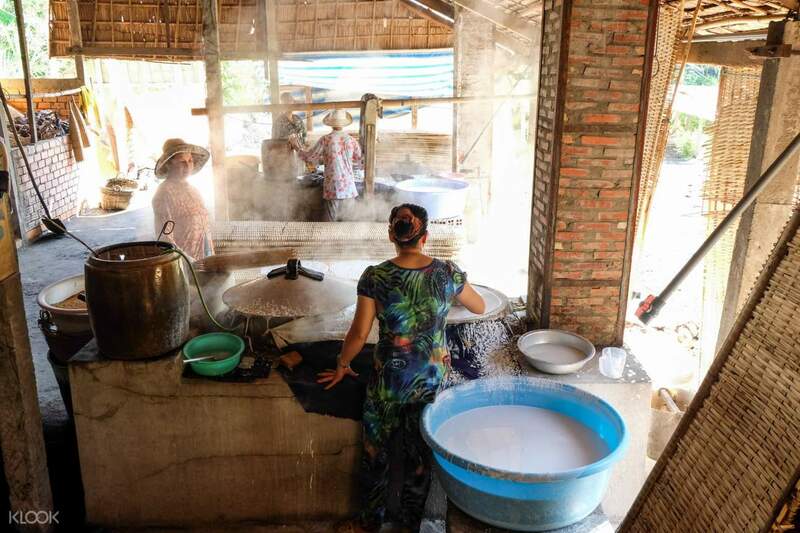 You’ll really get to experience the culture of Vietnam first hand through this trip - from tasting their local delicacies, riding their gondola, to interacting with natives. Our guide (Mr. Trew) also did a wonderful job in making the tour a memorable experience for all of us! He went above and beyond his role and tried his best to accommodate everyone. Had a great trip experience despite hot weather. Tour guide "Mr Dong” is knowledgeable and approachable, thumbs up for him! Overall this trip is a must for first time visitor to Vietnam! Value for money! Had a great trip experience despite hot weather. Tour guide "Mr Dong” is knowledgeable and approachable, thumbs up for him! Overall this trip is a must for first time visitor to Vietnam! Value for money! We had a fun tour guide and very knowledgeable. Over all its fun, on-time and enjoyable. Very worthy to try. Tips: Ride is 2hrs and 2hrs again to go back so bring food or water with you Bring hats or apply sunscreen since its very hot during this time. As always expect that there are always the other tourists.. lots of them. We had a fun tour guide and very knowledgeable. Over all its fun, on-time and enjoyable. Very worthy to try. Tips: Ride is 2hrs and 2hrs again to go back so bring food or water with you Bring hats or apply sunscreen since its very hot during this time. As always expect that there are always the other tourists.. lots of them. The tour for me was an excellent package. From the tour guide, bus condition and keen details of the tour. Its all worth it for every penny and time you spent. Looking for package tour like this, affordable and complete package. The tour for me was an excellent package. From the tour guide, bus condition and keen details of the tour. Its all worth it for every penny and time you spent. Looking for package tour like this, affordable and complete package. Amazing trip and good value for money! Meet up location was quite crowded but very easy to get to from district one. The bus ride was quite long but comfortable and they handed out water. The visit to the temple was standing in the boat ride along the Mekong Delta was comfortable. The visit to the coconut candy farm and the sampan ride and also the visit to the local honey plantation was very enjoyable. The food was also simple but delicious and many of the factories offered food for you to buy. Water and sugarcane juice was available to purchase at every stop and it was very cheap. The tour was great value for money but the only downside was that the weather was really hot and sweaty the whole time. Amazing trip and good value for money! Meet up location was quite crowded but very easy to get to from district one. The bus ride was quite long but comfortable and they handed out water. The visit to the temple was standing in the boat ride along the Mekong Delta was comfortable. The visit to the coconut candy farm and the sampan ride and also the visit to the local honey plantation was very enjoyable. The food was also simple but delicious and many of the factories offered food for you to buy. Water and sugarcane juice was available to purchase at every stop and it was very cheap. The tour was great value for money but the only downside was that the weather was really hot and sweaty the whole time. Purchased this tour on klook and it was very easy and hassle free. We did the tour on our first day in Vietnam and i can say that it was worth it. It was such a fun and exciting adventure. Our tour guide was very funny, approachable and speaks english very well. Although it was very hot overall it was worth it since you get to see a lot so its defined a must try in vietnam! Purchased this tour on klook and it was very easy and hassle free. We did the tour on our first day in Vietnam and i can say that it was worth it. It was such a fun and exciting adventure. Our tour guide was very funny, approachable and speaks english very well. Although it was very hot overall it was worth it since you get to see a lot so its defined a must try in vietnam! The tour is worth the money and time! Our tour guide is very accommodating and funny. There are a lot of places to visit included in this tour. The bus is also very comfortable. -I suggest you don’t buy honey products at the last stop of the tour as the taste is different from the one they serve. The tour is worth the money and time! Our tour guide is very accommodating and funny. There are a lot of places to visit included in this tour. The bus is also very comfortable. -I suggest you don’t buy honey products at the last stop of the tour as the taste is different from the one they serve. This has to be the best trip I have ever booked through Klook. The tour guide is very knowledgeable. The pagodas were impressive. The river cruise is interesting. The lunch is good enough. The trip along one of the tributaries of the river is worth it. For the price they charge, this is a must do while in Vietnam. This has to be the best trip I have ever booked through Klook. The tour guide is very knowledgeable. The pagodas were impressive. The river cruise is interesting. The lunch is good enough. The trip along one of the tributaries of the river is worth it. For the price they charge, this is a must do while in Vietnam. For a full day tour, the price is fair. Went to a temple, before heading to take the ferry to some island to have lunch. A very basic lunch is included, you can order more food at your own expenses. All in all, it’s an alright tour but not compulsory to go for unless you have too much time. For a full day tour, the price is fair. Went to a temple, before heading to take the ferry to some island to have lunch. A very basic lunch is included, you can order more food at your own expenses. All in all, it’s an alright tour but not compulsory to go for unless you have too much time.